If you’re trying to share, send or view photos you’ve taken with a Nikon D5100 and there is some kind of size restriction, either due to space or time, you can resize the photos before you even transfer them from the camera. 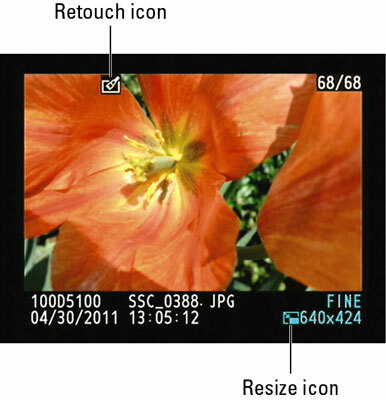 The in-camera resizing tool, found on the Retouch menu, works on both JPEG and Raw images. If you apply it directly to a Raw image, though, you lose the chance to adjust the resized image through the camera’s Raw conversion tool. So you may prefer to do the conversion first, which creates a JPEG copy at the original size, and then create a small copy of that JPEG image. Select the Resize option and press OK. Select Choose Size and press the Multi Selector right. The screen lists the possible sizes for your small copy. 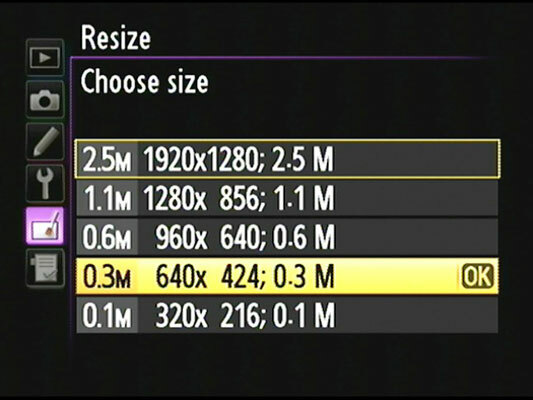 For each option, you see two values: the size in megapixels (M, in the menu screens) and the pixel dimensions (number of pixels across by pixels down). Highlight the size you want to use for your copy and press OK.
You’re returned to the main Resize menu. Choose Select Image and press the Multi Selector right to display thumbnails of your pictures. You see a little icon in the top-right corner of the thumbnail. Press the Zoom Out button again to remove the tag if you change your mind. After selecting all your pictures, press OK.
A screen appears asking you for permission to make small copies of the selected photos. Highlight Yes and press OK. The camera duplicates the selected images and downsamples (eliminates pixels from) the copies to achieve the size you specified. Your original picture files remain untouched. If you want to resize just one photo, you can save some time by following this alternative path: Put the camera into playback mode, display the picture in single-image view, and press OK. The Retouch menu appears over your photo. Highlight the Resize option and press OK. You then see the screen offering the list of possible new sizes; select your choice and press OK to go to the confirmation screen. Highlight Yes and press OK to finish. Either way, when you view your small-size copies on the camera monitor, they appear with a Retouch icon at the top of the screen and a Resize icon at the bottom. The filename of the resized image begins with SSC_ (or _SSC, if the original was captured using the Adobe RGB Color Space). You can’t zoom in to magnify the view of copies that you created by using the two smallest sizes.